Businesses have lots of papers to manage. It is really difficult to manage and organise them. Content Management System is an answer to all the problems related with managing and organising this vast amount of data. A CMS or ‘Content Management System‘ quite literally allows you to control and manage the content within your web site without technical training. It helps in managing the data on the website or on the online web portal in a much easier and effective manner. 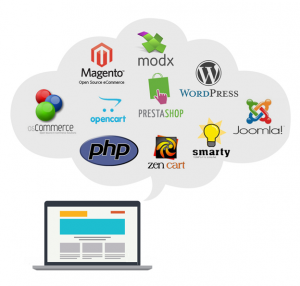 There are many, many advantages to using a web content management system. Many companies find it difficult to keep their web site content as up to date as they would like. Often there are delays getting new content online, the site stagnates and your clients get to see outdated information. A CMS web presence allows you to manage your web site even if you have no technical knowledge, experience with HTML or web site design. A Content Management System (CMS) is a computer program that allows publishing, editing and modifying content as well as maintenance from a central interface. Beyond just being able to easily edit, delete and add pages to your website, you can add images, PDF files, audio and video files as well. You can edit the navigation of your website. Such systems of content management provide procedures to manage workflow in a collaborative environment. These procedures can be manual steps or an automated cascade. Why choose Omkarsoft for CMS website development? We at Omkarsoft web development company Bangalore trust that CMS website development is an important key to success of a business. Omkarsoft offer professional Content Management (CMS) Website development that is stylish and contemporary, instantly appealing to your target market, retaining their attention and increasing brand awareness. Our CMS website development solutions for your simple to complex needs give your business an enviable edge over the competitors.